Imagine that you were born in the Chicago area. You were raised here, went to school here, and you see Chicago as your home. This is true for me, and I am guessing many readers. Then imagine that, through no fault of your own, one or both of your parents is undocumented. You are forced to live with a constant fear that one of your parents could be taken away from you at any time and your family could be wrenched apart. Then one day, your mother or father is gone with no warning--deported to a place you may have never even visited. This might also be true for some readers; and it is precisely this everyday reality that is revealed as all too common through a report recently released by the Illinois Coalition for Immigrant and Refugee Rights. [Editor's note: The author of this piece is currently interning with the ICIRR.] The report, Illinois' Undocumented Immigrant Population: A Summary of Recent Research by Rob Paral and Associates, reveals the extent to which undocumented immigrants in Illinois are deeply integrated into families and communities, and thus the extent of our population that immigration reform would truly impact. The report, authored by Fred Tsao, analyzes data from Rob Paral and Associates, and contains many useful facts about undocumented immigrants in Illinois. However, what I found most compelling about the report was its statistics on families. Perhaps surprisingly, about 54 percent of the undocumented population in Illinois live in suburbs of Chicago, and another 36 percent live in Chicago proper. Around 7 percent of the population of Chicago, and 4 percent of the state is undocumented. This is already a significant portion, but the numbers become even more striking once the statistics on families are taken into account. Around 90 percent of undocumented immigrants in Illinois and Chicago live in family households. In Chicago 12 percent of family households, and 6 percent throughout Illinois, include at least one undocumented immigrant. Of the family households in Chicago that include an undocumented person, 90 percent are mixed status (meaning one or more family member has legal immigration status or is a citizen) and 79 percent have at least one native born member. This means that 886,000 residents of Illinois have at least one undocumented family member. Additionally, in 55 percent of married couples in Illinois where one spouse is undocumented, the other has lawful immigration status or is a U.S. citizen. One hundred forty-five thousand families with children, or 36 percent of immigrant families with children in Illinois, have at least one undocumented parent. Of these immigrant families, 74 percent include only native-born children. Each one of these statistics represents real people and real families. Yet as deportations have reached an unprecedented high under the Obama Administration, deportations within Illinois have naturally spiked as well. 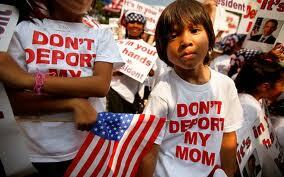 As of December 2013, the Obama Administration had deported 1.9 million immigrants. Illinois' undocumented immigrants live predominantly in mixed-status families, often with a U.S. citizen spouse or child. This finding is contrary to the common image of undocumented immigrants as single and unattached. On the contrary, undocumented immigrants have strong equities in this country, a fact that provides a powerful argument against enforcement policies that separate these immigrants from their lawfully present spouses and children. In the near future, as we continue to debate, and hopefully pass immigration reform, the reality faced by families in our own community must be at the center of the discourse around the issue. All people are equally human and deserve equal human rights. When families are torn apart by deportation, they are destabilized and subject to poverty and emotional, psychological and physical hardship. Children who were born in our city and state are forced to deal with pain and shoulder responsibilities no child should be subject to. A full 12 percent of Chicago families, or 145,000 families with children throughout Illinois, are currently left open to the threat that their loved ones could be deported at any time--passing immigration reform and stopping deportations truly cannot wait. Of course the children should be deported with the parents. The only reason that they are listed as US Citizens, is because the parents came into this county ILLEGALLY while they are pregnant and then continued to have more children while here, usually at the cost of the American people. The law that makes anyone born in this country a citizen is very wrong and needs to be repealed. It is one of the hugh draws for ILLEGALS and should be repealed retroactively. Your constant calling of them as 'undocumented' is an insult to every single person who immigrated to this country legally. Do you call rapists 'undocumented lovers'? A crime is a crime and rewarding a criminals encourages more criminals. Joe, I assume you are of Native American descent. If you are not, then you are a descendant of immigrants. Yes, I am the desendant of legal immigrants. And before they died, they were extremely offended by the last legalization of ILLEGALS. They followed the correct process and found it fair and understandably necessary. And by the way, so called Native Americans are just the desendants of earlier immigrants. John Doe - actually Native Americans and African-Americans (not "immigrants" as you intend the term) are the populations most harmed by illegal immigration. Back in 2006 when this same reform was proposed, many progressives were against it, including Paul Krugman, Thom Hartmann and Michael Linn (then with Mother Jones magazine). Illegal immigration is a complex issue but reflexively repeating the disaster 1986's reform is going to cause far more damage than saving the damage done to these sympathetic families. So "illegal" just wraps it up for you, Joe? Never mind the millions of people suffering every single day because of ignorant pigs like yourself. Deport citizens? Let's start with YOU.